Raven’s Nest at Sherwood Forest Resort sites high above the treetops. 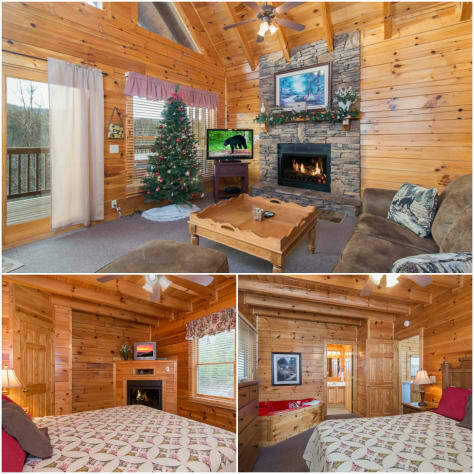 This roomy 1-bedroom; 1-bathroom cabin in Pigeon Forge sleeps up to 4 people, with 1 king-sized bed and 1 queen-sized sofa bed. 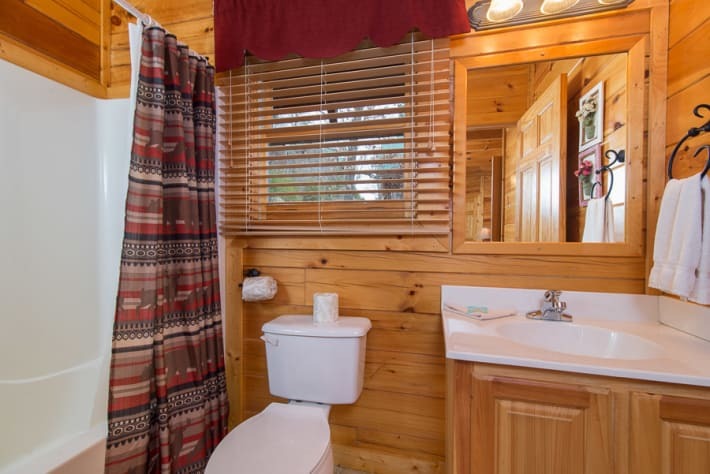 This cabin is fit for the WHOLE family, so don’t forget to take the family dog with on your getaway as this property is pet friendly. 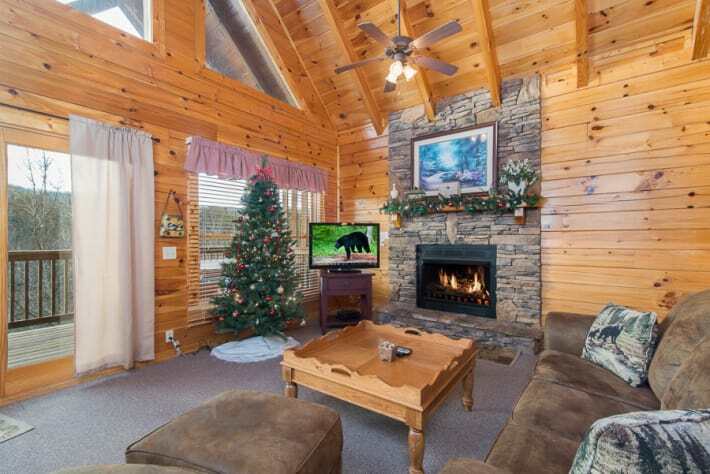 Relax in the open airy vaulted ceilings while sipping hot chocolate next to the alluring stacked-stone fire place. 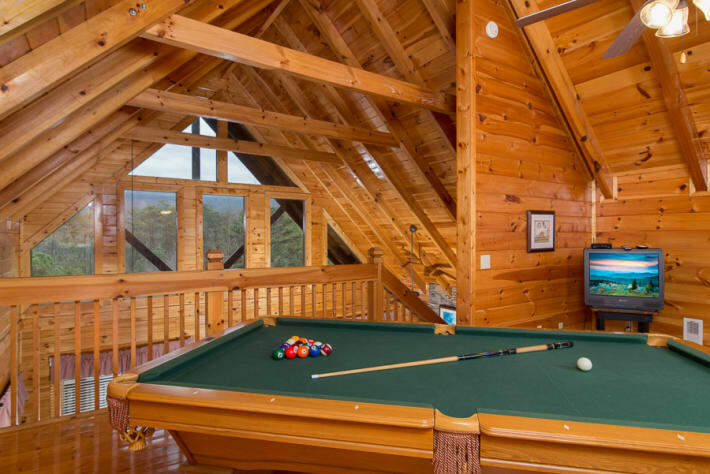 Unwind with a game of pool in the loft while appreciating the endlessly rolling mountain view. 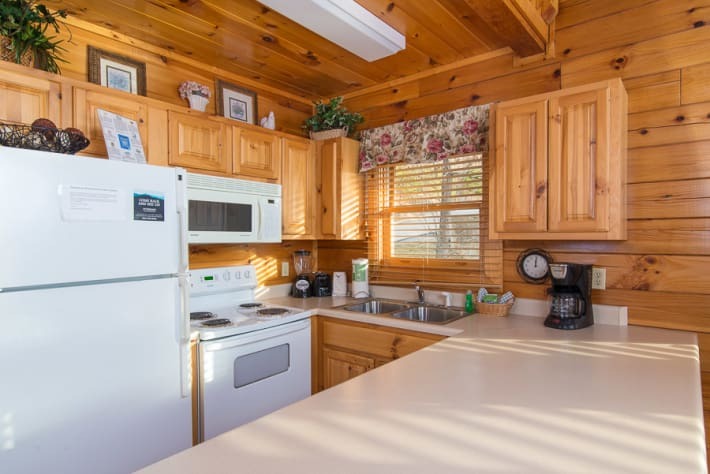 Prepare unforgettable family meals with the fully-equipped kitchen and gas grill, and enjoy the convenience of an in-cabin washer/dryer. 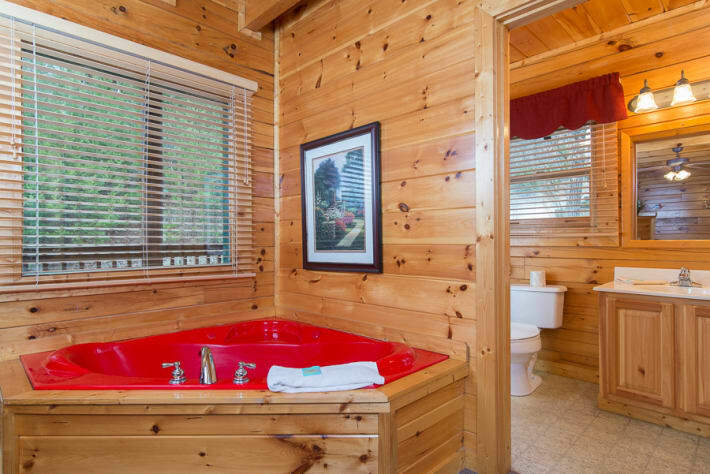 Retreat to the bedroom after a day of exploration to pamper yourself in luxury, with a jetted tub and fireplace, you may not want to come back out. 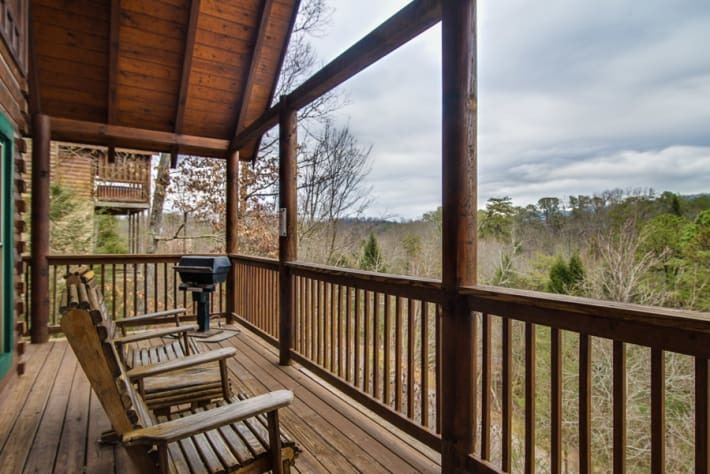 Check out the wrap-around porch with a private hot tub to soak in the amazing twilight views. 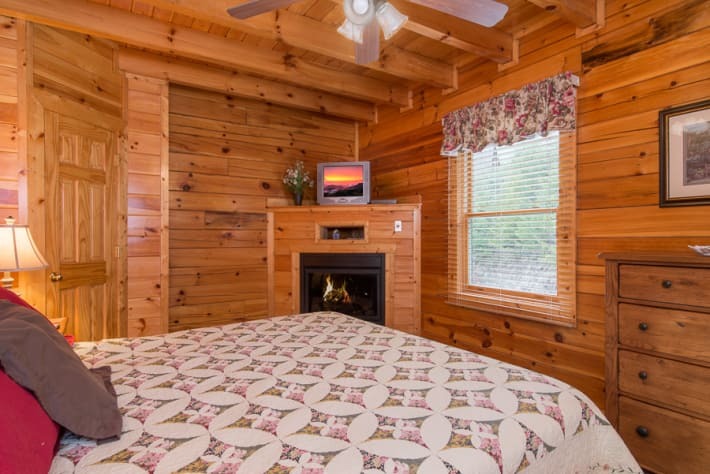 Start your days sipping coffee and relaxing in the rocking chairs while morning birds serenade you. 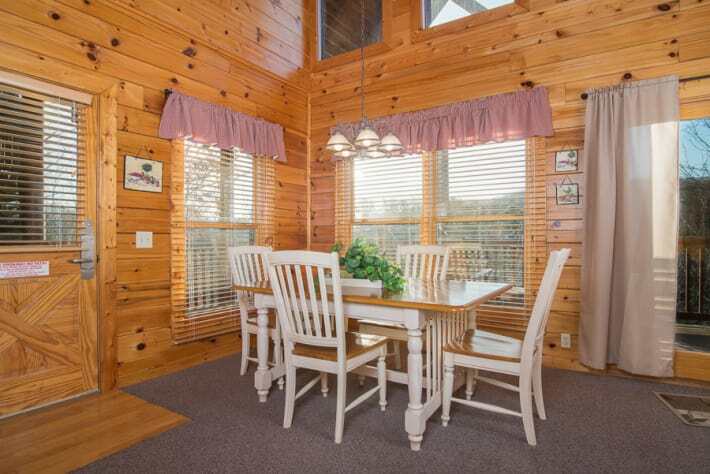 Beautiful mountain views and a touch of luxury, along with an unbelievable location within five minutes of all of the great shopping, dining and fun in Pigeon Forge, make Raven's Nest an ideal cabin rental. 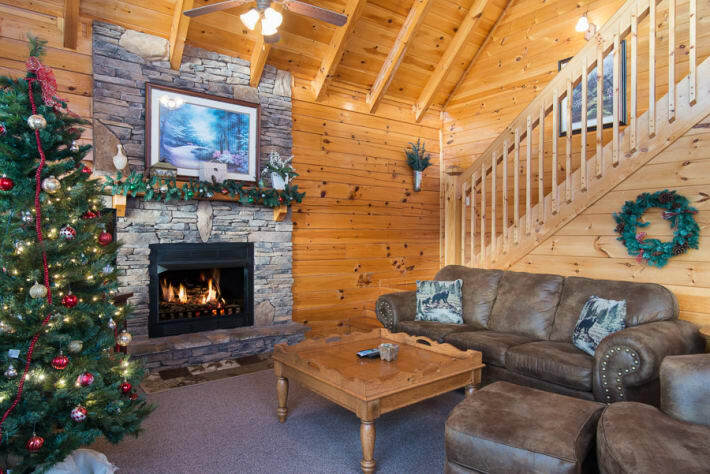 On the hill, perched overlooking Mount LeConte, is where the gated community of Sherwood Forest Resort is located. 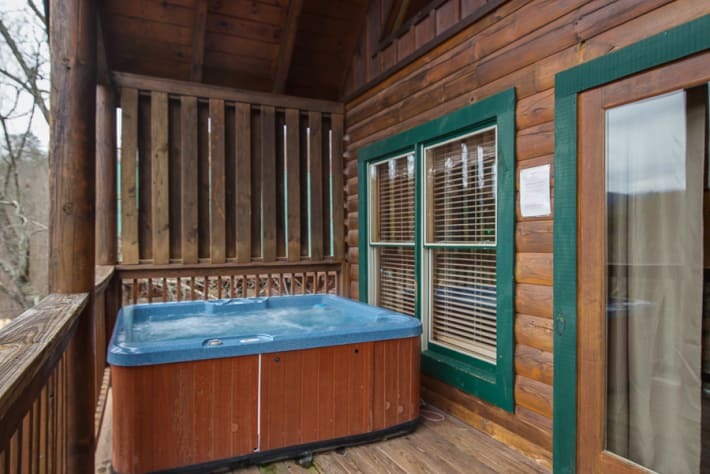 Offering on-site check-in at the main resort entry gate and a large seasonal outdoor community swimming pool, Sherwood Forest Resort makes a great home away from home. 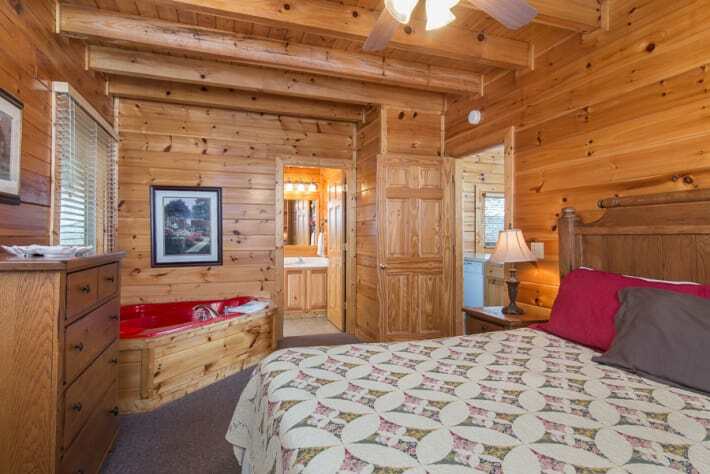 The grounds are meticulously maintained and blend seamlessly into the surrounding mountain terrain. 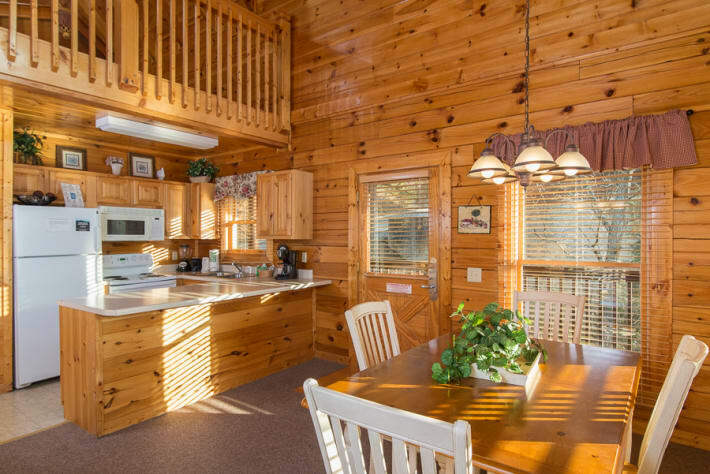 In just minutes, trael to the Parkway in the heart of Pigeon Forge from your door step, where your days can be filled with adventures! Stop off at The Island of Pigeon Forge, with shopping, dining and entertainment for all ages. Grab a rocking chair for the spectacular fountain show choreographed to music. Head over to Tanger Outlets at Five Oaks for a shopping extravaganza then check out Dixie Stampede for dinner and a show. Don’t miss out on one of the many games of mini golf in the area, making vacations and memories for years. Just a few miles down the Parkway, visit downtown Gatlinburg, where you can find an assortment of breweries, distilleries and wineries to wet your whistle. A can’t-miss attraction is the Ripley’s Aquarium where you can visit the state of the art underwater tunnels through shark reefs or head over to Ripley’s Believe It or Not Odditorium with over 3 stories of unusual oddities. Don’t miss the variety of mini golf challenges, such as Circus Golf or Fort Fun. Grab a bit to eat at Big Daddy’s Pizzeria for scrumptious brick oven pizza. 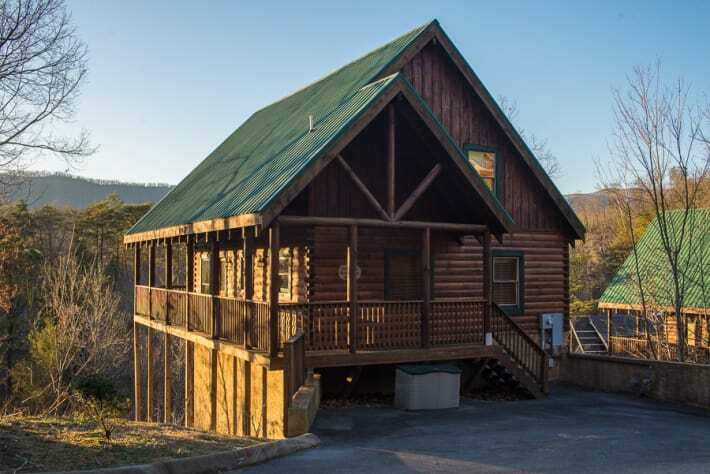 Being at the doorstep to the Great Smoky Mountains, means you are at the start to your wilderness adventure, with just over 850 miles of hiking and biking trails in every direction around you, the days can fly by with new undertakings each day. Drive up and do the half mile walk to Clingman’s Dome for a 360 degree breathtaking view from one of the Appalachian Mountain’s highest points. Go white water rafting down the Pigeon River with Smoky Mountain Outdoors, one of the most exciting attractions in the Smokies. No matter your choice, adventure awaits.